A dusting of new snow. Freeze-thaw conditions (max 1°C Giovedì pomeriggio, min -8°C Sabato mattina). Winds increasing (calma Giovedì notte, venti freschi dalla N per Sabato pomeriggio). A light covering of new snow, mostly falling Martedì notte. Temperatures will be below freezing (max -2°C Martedì pomeriggio, min -7°C Lunedì mattina). Wind will be generally light. La tabella sopra da le previsioni meteo per Sun Peaks a specifiche altezze 2081 m. I nostri sofisticati modelli meteo ci consentono di fornire previsioni neve per la vetta, l'area intermedia e a valle delle stazioni sciistiche di Sun Peaks. Per accedere alle previsioni meteo ad altre altezze, per spostarti usa tab sopra la tabella. Per una visione meteo piu' ampia , controlla la mappa meteo di Canada. We've stayed at Sun Peaks a few times. We live in Vancouver which is 4 hours away, and while we have several local mountains for day trip skiing and only 2 hours away from Whistler, we really love spending our weekends at Sun Peaks. 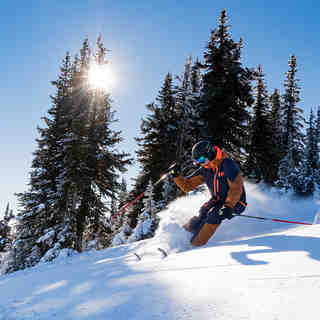 It has a great combination of amazing skiing, fewer skiers (and waits), good accommodations and food, and all at a reasonable price. Whistler is more than double the price and Whistler is so busy. We like the big open runs at Sun Peaks including the 5 mile long green run, which is amazing!